The UFO Auction is coming! UFO Auction is quickly approaching! Looking for donations! Please contact Susan Spinelli or myself for a pickup at a location of your choice! You may also bring items to our January meeting, Liz Swan will be collecting that evening. This entry was posted in Guild Activities, MVQ and tagged UFO Auction. The “Unfinished Object” auction will be held at the February meeting. This is a fun night and a major fundraiser for MVQ. If you are planning to donate a large item to the bring it UFO Auction, please DO NOT to the January Meeting. Instead, tell me what the item is, and I will include it in the list of things for the Auction. Then, DO bring it to the February Meeting (UFO Auction night). Please hold on to books and magazines that you might want to donate. I will be accepting them AFTER the UFO Auction for the Boutique. Better yet, bring them directly to the Quilt Show Set up Day. They are better suited for that venue. Thank you! Thanks to Ildi Tary and her helpers, over $2000 was netted at the UFO auction this year. It appears to be a record for the books! Ildi will pass the excess “treasures” along to Angie Cyr for the White Elephant Table at the Quilt Show- so watch for the bargains. This entry was posted in MVQ and tagged UFO Auction. One month after joining the Guild, 5 years ago, I found myself caught up in the bidding frenzy that occurs every February at the UFO auction. Lots of cool, gotta-have-it stuff!!! YES, good stuff. One particular item beckoned me….a huge box filled with solid colored, polyester and cotton, twill weight fabric; EVERY color of the rainbow, but mainly BRIGHTS! 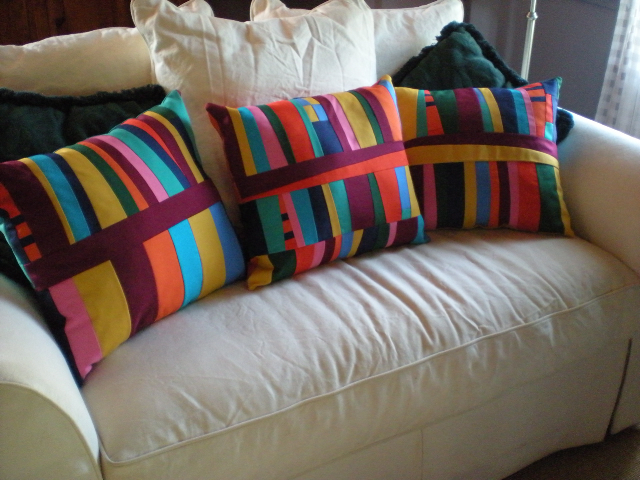 Just Gorgeous I think, no one will want them, its polyester! 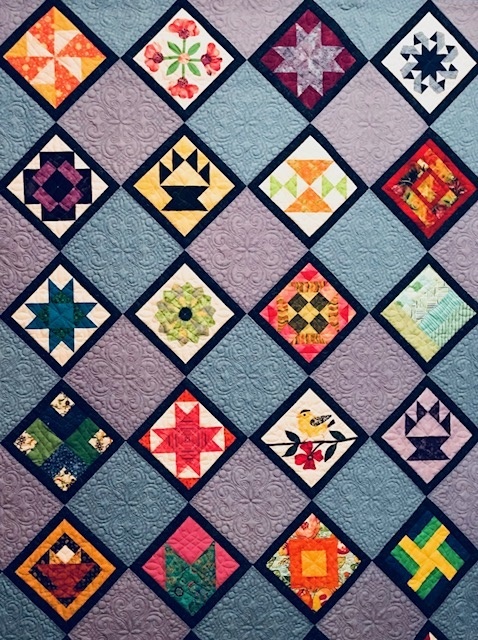 Being inexperienced, I failed to recognize the gusto, the fevered pitch, the determination of MVQ quilters and I quickly lost the bidding war. I suffered massive bidder remorse, depression, and then was obsessed about my loss. I approached the “winner” to ask to buy her out…..and luck was with me as she quickly said “let’s split it”. And so began the next journey of this FABULOUS fabric which has been sitting in my sewing room since that day, five years ago. Stop me if this story sounds familar. We all know, you can never have enough fabric, so when inspiration struck this summer …I was READY! I attacked those polyester and cotton textiles with a vengeance. I made: 2 personalized “coloring book” tote bags for the great nephews birthdays, they held all of their gifts and goodies; 16 tote bags to hold personal care items for a battered woman’s shelter (a few great accent fabrics added more pizzazz); 2 larger tote bags for shopping green instead of choosing “paper or plastic”; 3 – 17″ Nancy Crow style pillows for the cabin of our sail boat, highly washable; 2 ditty bags to hold wallets, keys, cell phones and items we didn’t want to lose overboard; 2 large ditty bags for containing spare oak mast wedges and a collection of miscellaneous engine parts; and 4 “superperson” capes for the same 2 great nephews and their super friends. This entry was posted in UFO Auction and tagged UFO Auction.